"A superb read, even for those who think themselves already well-versed in this topic." -- John T. Kuehn, Ph.D., William A. Stofft Professor, U.S. Army Command and General Staff College. Author of Agents of Innovation. As July turned to August in 1914, all the Great Powers of Europe mobilized their armies and then went to war with one another. It would take more than 50 months for peace to return, and the better part of a century to heal many of the wounds. Germany acted only near the end of a chain of actions by other nations, but German troops moved first and set the pattern for the war. They smashed through neutral Belgium before thrusting deeply into France, coming close to knocking France out of the war, and soon were making huge inroads in Russia as well. It was a remarkable performance for an army outnumbered by its foes. Yet four years later the German Empire was swept away, its army a shell, its people starving, its government in chaos. How did the leaders of Imperial Germany come to make the decisions that committed their nation to an all-or-nothing war based on a highly risky strategy? This book explores the background of the decisions, what those who made them knew and thought, what they failed to look at and why. It explains the Prussian Great General Staff (Großer Generalstab) and the part it played in planning and preparing for war. It follows the action of August and the first part of September 1914 to show where they went wrong and how other options could have achieved Germany’s aims with far lower risk and cost. These options were realistically available and the book probes why the nation’s leaders failed to consider or rejected them. The German leaders in 1914 weren’t Hitler. They valued security over conquest and didn’t go to war to expand their empire. They weren't the first to light the fuze that led to war. They thought and acted as leaders very often do. We can understand them in terms of patterns we see all around us, patterns we even see in ourselves. Their decisions had results that were uniquely catastrophic, but the way they were reached was quite ordinary. The Plan That Broke the World explains it all briefly and crisply, in non-technical terms, drawing on the latest research. There are 35 images, many unique to this book, to illustrate specific aspects of the story. Four charts and thirteen high-quality maps, all but one drawn especially for this book, present complex information in forms that are immediately understandable. There’s no other book like it. William D. "Will" O'Neil studied math and business economics; served 41/2 years as a U.S. naval officer (plus another 26 years in the Naval Reserve, retiring as a captain); was a systems engineer in industry and government, working on development of many sensor systems, command and control systems, ships, and aircraft; and became first an engineering manager and then an executive in government and industry. Since the 1970s he has worked very closely as an advisor to top-level officials, commanders, and executives in government and industry. He made his living by knowledge and worked tirelessly to expand it-technology, war, management, and the physical, biological, and social sciences. Along the way O'Neil has written a great deal. Much in the form of reports that are secret, or at least not available for public viewing, but there have been dozens of open reports, articles, novels and various other pieces. Excellent concise book based on solid military expertise with abundant sources. In the new historiographical harvest occasioned by the First World War's centenary, Germany's "Schlieffen Plan" remains indispensable to discussions of origins and trajectory. The plan for a massive opening offensive on France through Belgium is generally associated with German blundering, whether because trying to cope with enemies on two fronts by neutralizing one (France) before the other (Russia) could fully engage unduly risked adding a third (Britain), or because the plan was botched in execution, or because its whole raison d'etre resulted from failing to retain after 1890 either Bismarck or his successful policy of keeping France isolated from Russia. Rarely are such comingled factors handled in comprehensive depth, however. This new book offers an atypical and highly readable focus directly on the Schlieffen Plan itself. The author's upfront disclaimer, that he is not a professional historian and has not relied upon new archival research, is important, valid, and welcome, but should not obscure that this crisp and cogent study also develops valuable historical insights. The thoughtful and logically flowing text is neatly augmented by clear, well-positioned maps, judiciously-chosen photographs, and sparse yet adequate end notes. 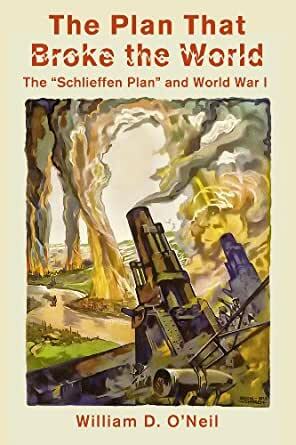 My previous understanding of the Schlieffen Plan was shaped by reading, decades ago, Barbara Tuchman's "Guns of August" (now more than half as old as the war's outbreak itself) which implies that failures in execution were important: Schieffen's dying word advice, a year before the war's outbreak, "make the right [flank] strong," was undermined by Germany shifting some of its forces from the right to the center/middle flank and to the eastern front, and by von Kluck's First Army "turning" before Paris instead of proceeding further west to "envelope" the French capital from the side or rear. This new work builds on convincing elements of more recent studies, such as that of Terence Zuber, to argue not only that, even with more skillful execution, the Schlieffen Plan was impractical and imprudent (the downside risks of failure were disproportionate to the upside potential of success, and the odds of success were small anyway), but also that it really wasn't even a plan at all, but more of a "thought experiment," used by German strategists even more reliant upon doctrine, training, and wishful thinking. In place of professional historical training, the author promises to deploy "other qualifications of value," and this book does not disappoint. The ability to explain military strategy in clear layman's terms is repeatedly brought to bear, as in "have you ever walked fifteen miles...[per day, carrying] fifty pounds...in blazing heat...for four weeks?" Or, in estimating that "to deploy for battle" promptly, the main thrust of Germany's invading army needed transit corridors double the width actually available. Author William O'Neil persuasively indicates that not optimally exploiting existing transport and communication technologies essential to the "war of movement" envisaged by its planners contributed to the failure of Germany's initial attack. There was sufficient stationary thunder, but not enough Blitzkrieg. This limitation was compounded by a lack of sufficient troops to defeat France fast enough to thereafter shift large numbers to shore up the (initially) lightly-manned eastern front against Russia. To the extent that Schieffen's thought experiment might have been an argument for a larger German army, it had failed even before the war began. At any rate in place of the theoretical "Schlieffen bear-hug" envelopment, the actual German assault was more like a "billy goat...doing a lot of damage but never delivering an annihilating blow and ultimately exhausting itself." Going beyond straight historical analysis, the book counterfactually and plausibly suggests that investing in trucks rather than dreadnought warships might have given Germany's rightwing attack on France a decisive edge, and more radically, that an altogether different strategy, consistent with dynamic Bismarckian flexibility, and based on a mobile "active defense," would have had better chances. Instead Germany, and its Austro-Hungarian ally, pursued the "glittering payoffs" of neutralizing their opponents for a long time, but in so doing undertook "extraordinary risks." The German war planners "strained at gnats of principle and swallowed camels of aggression." O'Neil's argument points to a fatally rigid path dependency in early twentieth century German military thinking. Prussian strategies (active reserves, mass education, mass conscription, skill training, flexible and rapidly deployed defense through attack, etc.) that worked so brilliantly in Bismarck's mid-19th century wars of unification were misapplied in 1914 on a catastrophic scale that "broke the world." Only at the final stage of proceeding from his logical and well-formulated argument to such conclusions does O'Neil seriously part from historical analyses, to make (plausible but tentative) psychological observations about the general limitations of human risk-taking on a massive and modern scale. The book series promised along such lines seems likely to offer further value to historians, however, and I will be looking forward to seeing future volumes come forth. O'Neil understandably dodges the "war guilt" minefield, as have most other recent historians, but this book also has implications there worth noting briefly. Few commentators now hold Germany either solely responsible or blameless for the Great War's outbreak, but the question of relative severity amongst the multitude of blunders made by all parties (and thereby over-determining the war's causes) still has relevance. This book modestly, yet persuasively, strengthens the case that Germany's errors were not only more significant in scale and import than those of other countries, but also that the "Schlieffen Plan's" flaws were rather more irremediable and predictable than has been generally appreciated. I recommend this book to anyone interested in the German invasion of Belgium and France in 1914. The author presents a unique view of pre-war German military decision-making and its impact on how the Schlieffen plan was put into action. Most histories of the Great War gloss over subjects like planning processes, command and control, communications, but William O'Neil treats all these subjects, and more, in a straight-forward and concise manner. He also makes it interesting too! The author argues that the Schlieffen Plan, such as it was, failed because the German army could not effectively adjust operations as the campaign unfolded. This deficiency resulted from a lack of reconnaissance to gain useful intelligence, communications to exercise command and control, and motorization to rapidly move forces. Thus, once the field armies went into the attack, senior commanders were unable to bring their combat strength to bear on the French army's vulnerabilities. Because of its easy-reading style and unique focus on campaign planning and decision-making, this book will appeal to generalists and specialists alike. World War I claimed at least sixteen millions lives'; it was the bloody and tragic prelude to the even greater horrors of World War Ii. In this short book of less than two hundred pages the author William D. O'Neill provides a thought provoking look at German military plans prior to the Great War. General Schlieffen was the German war theorist who in 1906 produced a short memo describing a possible scenario for German victory in a war against France. The proposal was for German troops to invade northeastern France by launching massive assaults which cut through the territory of neutral Belgium. Belguim was created in 1839, following the Napoleonic wars, to provide a buffer small nation between France, Germany and Great Britain across the English channel. O';Neill teaches us that the plan was never put into practice as General von Moltke was unable to mount the necessary troops and provide the proper transportation and logistical support to make it work. Though the Prussian military tradition had produced an efficient and deadly fighting army plans did not go according to Hoyle for the Kaiser's troops. Stalemate rather than swift movement became the sanguinary norm on the Western Front until allied victory in 1918.
which has more information than many other longer and more expensive books on the topic. Recommended.